This article is about the automobile. For other uses, see Honda Integra (disambiguation). The Honda Integra is an automobile produced by Japanese automobile manufacturer Honda from 1986 to 2006. It succeeded the Honda Quint as a more luxurious and sport-oriented derivative of the Civic. The Integra was one of the launch models for Acura in the US in 1986. Throughout its life, the Integra was highly regarded for its handling and performance. The Integra Type R is widely regarded as the best front wheel drive car of all time. Car and Driver magazine named the Integra to its annual Ten Best list six times: in 1987, 1988, and 1994 through 1997. The GS-R model was called out specifically in 1994 and 1995. It made a return on the Ten Best list as the Acura RSX, in 2002 and 2003. This vehicle debuted in Japan in February 1985 as the Honda Quint Integra, available only at Honda's Japanese dealership sales channel Honda Verno before going on sale a year later in North America as part of the then-new luxury Acura lineup. The three-door hatchback was the only model available originally, with a five-door arriving in October 1985. The four-door saloon bodystyle became available in Japan in the autumn of 1986. Only the hatchback versions were sold in the U.S. A 1.6 L DOHC 16-valve four-cylinder engine powered most versions. The engine was the vehicle's most publicized feature, as DOHC, multi-valve engines were not commonplace in entry-level models at the time. In most European countries, only the five-door liftback was offered, as a replacement for the Honda Quint. Typically for European Integras, only the 1.5-liter 85 PS (63 kW; 84 hp) carbureted engine was available. The five-door liftback model was also sold in Australia rebadged as the Rover 416i. Except for in Britain, Honda did not offer the more powerful 1.6 DOHC fuel injection engine (in the UK known as the Integra EX16) in Europe. The ZC engine was also shared with the Honda Concerto, which was sold at newly established Japanese dealership sales channel called Honda Clio, which sold luxury oriented products like the Honda Legend. In Japan, while the VX- and RX-trimmed four-door (DA2) used the 1.5 L EW5 engine, all other model and trim combinations offered only the DOHC ZC engine, with a carburetor on GS, ZS, and LS trim packages, and PGM-FI on the top level GSi three- and five-door, and the RSi three-door trim package. Vehicles installed with a carburetor earned 15.4 km/L (44 mpg‑imp; 36 mpg‑US) in Japanese Government emissions tests and 115 PS (84.6 kW; 113.4 bhp), and 26 km/L (73 mpg‑imp; 61 mpg‑US) at consistent speeds above 60 km/h (37.3 mph). Vehicles with PGM-FI earned 14.4 km/L (41 mpg‑imp; 34 mpg‑US) in Japanese Government emissions tests with 135 PS (99.3 kW; 133.2 bhp), and 24.5 km/L (69 mpg‑imp; 58 mpg‑US) above 60 km/h (37.3 mph). In Japan, the Integra took the entry level marketing position at Honda Verno, below the sporty Prelude and larger, luxurious Vigor. Compared to the US, the European Integra was aimed downmarket and generally lacked equipment, with neither trim level (LX or EX) offering painted bumpers, central locking, power windows, nor air conditioning, even though a small number of fully equipped, left-hand drive fuel-injected Integras were sold in the Netherlands. The Integra EX16 did offer a sunroof, painted bumpers, a rear spoiler and Hi-Fi stereo equipment, but neither electric windows, central locking nor air conditioning were available. This was considered as a drawback to its European competitors such as the Peugeot 309 1.6 injection and the Renault 11 Turbo, that all could be equipped with comprehensive, albeit expensive, equipment. The first Integra never became as popular in Europe as it did in the US, but was praised by most motor magazines for its styling and overall road performance. The styling reflected the popularity of Honda's performance coupe, the Honda Verno sports coupe companion Honda Prelude, with the Integra offering a coupe for added cargo accommodation, and a slightly smaller appearance to the larger Honda Vigor. Largely unencumbered by emissions regulations, British market cars produce 85 PS (63 kW) in the 1.5 and 125 PS (92 kW) in the 1.6-liter EX16. 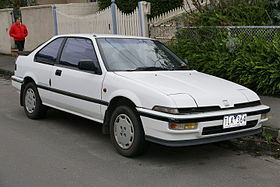 Being designed as the successor of the Honda Quint, the Integra is closely related to the Civic, although it featured a small list of key upgrades over its smaller stablemate to help merit a price increase over the CRX Si, which was otherwise the sportiest subcompact vehicle being offered by Honda Verno; enlarged 4-wheel disc brakes replaced the small front-disc/rear-drum setup used by the Civic and CRX, suspension calibration was re-worked, better tires were used and a 113-hp DOHC fuel-injected 16-valve engine was used in place of the SOHC unit from the CRX Si. Just like the Prelude and the Vigor of that period, the Integra featured sleek, sporty pop-up headlights, like its Japanese dealership Honda Verno stablemates, with the CRX adopting semi-concealed doors over the headlights. Nearly 228,000 units were sold during the four-year run of the first-generation model, most of them in the United States. The first generation Acura Integras actually came with two different engines. Although they shared the same engine code (D16A1), there were a few differences. The engine differed in the years 1986 to 1987 and 1988 to 1989. The two engines are commonly called the "Browntop" and "Blacktop" due to the color of their valve covers. The "browntop" came in 1986 and 1987 Integras while the "blacktop" came in 1988 and 1989 models. The improvements in the "blacktop" engine included lighter rods, domed pistons for slightly higher compression, and an electric advance distributor (the "browntop" came with a vacuum advance distributor). The overall gain in performance was about 5 hp (3.7 kW) for 118 hp (88.0 kW). The 1988 and 1989 Integras also got a minor facelift, featuring slightly reshaped indicator lights, an improved climate control system and an update of the instrument clocks. In Europe, the discontinued Integra five-door Liftback was replaced by the Honda Concerto for the 1990 model year. This was the only generation to offer 3-, 4-, and 5-door models. Production of the 5-door hatchback ceased in 1988. The second generation Integra was introduced in April 1989 and in this generation, one of the first VTEC engines ever manufactured by Honda was installed in a JDM Integra DA series. For North America's GS-R only, the B17A1 engine is a 1.7-litre naturally aspirated engine with a specific power output of 160 PS (118 kW; 158 hp). VTEC engagement is at 4,800 rpm on the B16A engine, redline for the XSi is 8,200 rpm. All Japanese models remained exclusive to Honda Japanese dealership network called Honda Verno. There were two variants of the top DOHC VTEC model, the RSi, and the XSi. The RSi was the base model with a lighter weight thanks to wind-up windows, no rear spoiler and few options. Early RSi models also featured the S1 gearbox with slightly closer gear ratios than the Y1 fitted to the XSi. The XSi was the fully optioned variant with climate control and optional sunroof and ABS. The XSi had a 0–100 km/h (62 mph) time of 7.2 seconds and can complete a standing quarter mile in 15.1 seconds. This top spec DOHC VTEC model was complemented by more docile models that used dual-carburetor or PGM-Fi versions of the versatile ZC engine but in the more compact SOHC configuration. Similarly there were base and full options variants of these SOHC engine Integras coded RX/RXi and ZX/ZXi respectively. All vehicles sold in Japan had their width dimensions slightly reduced so as to be in compliance with Japanese government regulations concerning exterior dimensions so that the car would be officially recognized as a "compact" and not incur yearly taxes for being wider. In October 1991, the range received a mild facelift. At the same time, a 1.8-liter version of the four-door hardtop was made available in Japan. Called the ESi, it offered 140 PS (103 kW; 138 hp) at 6,300 rpm and was only available in conjunction with a four-speed automatic transmission. At the same time, the VTEC was upgraded and now had 170 PS (125 kW; 168 hp). This generation saw the discontinuation of the five-door hatchback, and the first availability of a four-door sedan outside Japan. The new hardtop bodystyle reflected a popular trend in Japan of offering an entry level sedan, such as the Civic-based platform the Integra used, in a reduced height four-door hardtop. The Integra sedan saw competition from the similarly sized Toyota Corolla Ceres, the Toyota Sprinter Marino, the Nissan Presea, and the Mazda Lantis. It should be noted that the sedan was only styled to look like a hardtop. The vehicle retained the B-pillar, while the doors were constructed without window frames. This styling carried over to the third generation sedan, and shared visual similarities to the Honda Verno larger companion, the Honda Vigor. The current Emperor of Japan, Akihito, maintains a gray 1991 Integra sedan with the 1.6 L engine, and regularly drives within the boundaries of the Imperial Palace. For the 1992 and 1993 model years, Acura offered a GS-R model. The GS-R hatchback came only with a 5-speed manual transmission and 1.7-liter B17A1 4-cylinder VTEC engine with 160 hp (119 kW). The GS-R model came with a rear spoiler and 195/60/VR14 tires and alloy wheels. Honda debuted the third generation model in 1993 in Japan at Honda Verno locations. Acura followed in 1994. It had an unusual four headlight front end design which was dubbed "bug eyes" by some enthusiasts. Standard power (in Japan) from the B18B engine increased to 142 hp (105.9 kW). In the U.S., the B18B1 produced slightly less power due to a lower compression ratio (emissions related).The top model was known in Japan as "Si", and it was powered by a B18C engine with a power of 178 PS (131 kW; 176 hp) VTEC. The "bug eye" headlights proved unpopular in Japan so all JDM Integras were given a minor facelift in 1995 with more conventional elongated flat headlights and a revised front bumper, the top model was relabelled the Integra SiR. This generation Integra was generally not available in Europe, although some markets such as Greece did receive this model. Those cars were fitted with a 105 PS (77 kW) version of the 1590 cc ZC engine. From MY1998 onward, non-JDM Integras (including Type R models) received a facelift to the front bumper which moved the embossed "INTEGRA" label to below the left headlights, eliminated the horizontal strut across the radiator grille and reshaped the headlight housing, turn signal housing and lower bumper. Dealer installed options for the third generation Integra included: security system, 15" alloy wheels, trunk mat, splash guards, fog lights, rear wing spoiler, sunroof (coupe only), CD changer, leather seats, leather shift knob and leather steering wheel. RS: Regular Sport, was available in both coupe and sedan. There was no sedan available in 1998. Model dropped in 1999. Equipped with the B18B1 DOHC engine putting out 140 hp (104 kW) and 127 lb⋅ft (172 N⋅m) of torque. In 1997, power ratings dropped to 138 hp (103 kW) and 124 lb⋅ft (168 N⋅m) of torque due to U.S. emissions regulations. Standard features were a cassette player, rear window defroster, and tilt steering wheel. Cassette player replaced with CD player in 1997. The RS's as well as Type R's did not come with sunroofs as an option, while the LS, SE, GS, and GS-R sub-models did. LS: Luxury Sport, was available in both coupe and sedan. From the RS, the LS adds air conditioning, power windows and door locks, cruise control, and a sunroof. In 1998, the LS became equipped with alloy wheels and in 2000 was given a leather wrapped steering wheel and shift knob. SE: Special Edition, was available in both coupe and sedan starting from 1995. SE's are only found in 1995 and 1996 model years until they were changed to be named the GS in 1997. From the LS, it added leather seats, alloy wheels on all years, and a rear wing spoiler (optional). GS: Grand Sport, was available in both coupe and sedan starting from 1997. Same standard features as the SE. GS-R: Grand Sport Racing, was available in both coupe and sedan. Equipped with the B18C1 DOHC VTEC engine outputting 170 hp (127 kW) and 128 lb⋅ft (174 N⋅m) of torque. Same standard features as the GS minus the leather seats. However, leather seats ended up becoming a standard feature on the GS-R starting in 1999. Auto transmission found in certain markets for this car. In 1995, Honda introduced the Integra Type R to the Japanese domestic market. The Type R came standard with a 200 PS (figure may vary in different countries, 195 hp USDM, 190 hp in Europe) factory-tuned variant of the B18C engine. Equipped with a close ratio 5-speed manual transmission and a Helical LSD, the DC2 Integra Type R had significantly improved performance and handling relative to the GS-R/Si/SiR-G Integra. These were the result of extensive changes, including a strengthened chassis with extra spot welds and thicker metal around the rear shock towers and lower subframe, weight reduction (reduced sound insulation, 10% thinner windscreen, lighter wheels), more power, rev limiter set at 8,500 rpm USDM (8,600 rpm JDM, 8,700 rpm UKDM), hand built engine featuring hand-polished and ported intake ports, high compression pistons, undercut valves and revised intake and exhaust systems, and suspension upgrades. The result was a capable sports coupe which was acclaimed by motoring journalists worldwide. There is only a 33 lb net weight difference between the Integra Type R and the Integra GS-R because the extra metal and cross bracing in the Type R negate much of the 98 lb of weight reductions. However, the JDM version was significantly lighter than the SiR (JDM ITR 96–97 could delete the air bags, A/C, rear wiper, radio, center console, clock, P/S and ABS). The DC2 Type R was the only Type R ever sold in North America with the Acura badge. For the European, Australian and New Zealand market the DC2 was sold as a Honda. The JDM DC2 Type R received significant upgrades in 1998 and is known as the '98 Spec R. Some of the main changes were a redesigned rear bumper, 16-inch wheel with 215/45R16 tires, 5-lug nut wheel hubs and bigger brakes. Gear ratios for the final drive were higher, making 1st to 3rd gears closer, while 4th and 5th were longer to maintain the '96 Spec cruising comfort. The engine power remained the same, but use of a new 4–1 long tube header brought torque lower down to 6,200 rpm. A final revision of the JDM DC2 Type R known as the '00 Spec R included a revised intake camshaft, and more finely balanced drive shafts. A final trim version offered in mid 2000 onwards for the JDM market (known as the "Type Rx") came factory fitted with motorized folding mirrors, dashboard clock, blue-hue carbon trim interiors, and an audio system as part of the standard package. it also included a hash pocket in the center console. Edmund's Insideline tested a 12-year-old stock Type R: 0–60 mph (97 km/h) in 6.8 seconds, 1/4 mile in 14.9 seconds @ 95.2 mph. Motor Trend clocked the Type R at: 0–60 mph (97 km/h) in 6.2 seconds, 1/4 mile in 14.8 @ 96.3 mph. Sport Compact Car clocked the Type R at: 0–60 mph (97 km/h) in 6.1 seconds, 1/4 mile in 14.5 @ 96 mph. In Japan the Integra is revered as one of the best sports cars of the '90s. On Japanese car review show “Best Motoring” the Integra Type R punched well above its weight competing with fastest 4WD Turbo cars of the time, the Nissan Skyline GTR and WRX STI. All American test cars had the optional A/C installed. Honda lost money on every 1995–2001 DC2 Type R sold, although extra dealer markups sometimes made for excessive dealer profit. The details of production, which included hand tooling in early versions and finishing the car through the use of various small fabrication shops in Japan, made for increased manufacturing costs that could not be made up in the list price of the vehicles. Honda produced the DC2 Type R for homologation purposes to meet FIA certification of the motor and the chassis changes to make the car more competitive in N-series and World Cup racing. Honda (and Acura in the US) deemed the car important for the marque's image and important for the racing programmes of the era, and the parent company therefore accepted a financial net loss on each vehicle sold. It has been acclaimed by motoring journalists worldwide, including Evo magazine, which named the Type R 'the greatest front-wheel-drive performance car ever', and TheAutoChannel.com, which similarly called it 'the best handling front-wheel drive car ever'. The Integra type R is considered a modern classic and prices have steadily risen. An original Type R can sell for twice its dealership price with a low mileage example reaching USD $63,800 at auction in 2018. The third generation also saw the production of a four-wheel drive option. Available only in the four-door sedan, the ZXi4WD (93–95) and Xi4WD (95-00) had 1.6L SOHC ZC engines coupled to a version of Honda's Real Time 4WD. The fourth generation Integra was introduced in Japan on April 13, 2001 and produced from July 2001 to July 2006. For North America (United States and Canada), it was introduced as the Acura RSX in accordance with Acura's new alphabetical naming scheme. It also had an entirely new engine, the K-series. The Integra came in two models in the United States, the RSX and the RSX Type-S boasting the K20A2 engine from 2002 to 2004, while the 2005 and 2006 RSX-S came with a K20Z1. 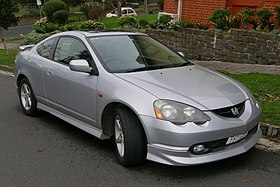 The RSX was sold as a Honda Integra in Japan and Australia, markets where Acura did not exist. In March 2006, Honda announced that the Integra would be discontinued in June after its final 300 cars were sold, due to the shrinkage of the coupe market. The reaction of the consumers towards the discontinuation, however, forced Honda to extend production until July 2006 and produce 150 more Integras. The Acura RSX was discontinued as well, as the RSX did not fit within the confines of Acura's re-structured market strategy. This left the Acura TSX as Acura's entry-level vehicle. Also, the introduction of the similarly powerful and less expensive 2006 model-year Honda Civic Si was there to fill in the gap left by the RSX. The DC5 Type R (Japanese market only) comes standard with a K20A 220 hp (164 kW) 2.0 L DOHC i-VTEC four-cylinder engine. The "i" in i-VTEC stands for intelligent VTEC, which employs VTC (Variable Timing Control) to advance or retard the intake cam timing within a 50 degree range. The Integra Type R comes equipped with Recaro seats, four-piston Brembo front brakes, a close ratio six-speed manual transmission, a limited-slip differential, variable back-pressure exhaust system, and a stiffer suspension. The Integra and RSX have been popular in automobile racing. Realtime Racing used the Integra Type R and later the RSX Type S to compete in the SCCA World Challenge Touring car class for many years. Several cars were entered into the 2009 British Touring Car Championship season, and won the 2003 Asian Touring Car Series. In 1992, the Integra was used in Formula One as a safety car at the Canadian Grand Prix. The racing game Need for Speed: Underground featured both a DC2 Acura Integra Type R as well as a DC5 Acura RSX. In European and Japanese versions the Acura Integra is replaced by the Honda Integra. The racing game Need for Speed: Payback featured a DC5 Acura RSX Type-S as well. The film The Fast and the Furious (2001) features two main characters driving a DC2 Honda Integra. The first car is a red 1997 model driven by Edwin, played by Ja Rule. The second car is a four-door GSR driven by Mia Toretto, played by Jordana Brewster. Richard Hammond praised the UK spec Integra Type R for the Top Gear magazine, calling it "for the purist, the serious enthusiast". ^ "Acura Owner Stories, Events & Articles | Acura Owners Site". Owners.acura.com. 3 January 2011. Retrieved 22 February 2017. ^ Knapman, Chris (2018-07-20). "Honda Integra Type R: the greatest front-wheel-drive car ever?". The Telegraph. ISSN 0307-1235. Retrieved 2018-10-13. ^ "Is The Acura Integra The Best FWD Car Of All Time?". Motor1.com. Retrieved 2018-10-13. ^ "The Magic of the Integra Type R". Road & Track. 2017-11-22. Retrieved 2018-10-13. ^ "The Acura Integra Was The Sports Car To Have In The Late '90s". CarBuzz. Retrieved 2018-10-13. ^ Cironi, Davide (2015-11-02). "Why Is The Integra Type-R So Perfect From The Driver's Seat?". Petrolicious. Retrieved 2018-10-13. ^ Clavey, William. "How The Acura Integra Type R Makes Modern Sport Compact Cars Look Weak". Jalopnik. Retrieved 2018-10-13. ^ "Honda Integra: Honda Integra Type-R". Evo. Retrieved 2018-10-13. ^ "This 1997 Acura Integra Type R is the Holy Grail for 1990s youth". Retrieved 2018-10-13. ^ Büschi, Hans-Ulrich, ed. (3 March 1988). Automobil Revue 1988 (in German and French). 83. Berne, Switzerland: Hallwag AG. p. 316. ISBN 3-444-00469-9. ^ インテグラ（1989年4月終了モデル） [Integra (end of April 1989 model)]. Japan: Honda. Retrieved 9 February 2017. ^ 今まで販売したクルマ|インテグラ [Cars sold until now | Integra]. Japan: Honda. Retrieved 9 February 2017. ^ 自動車ガイドブック [Japanese Motor Vehicles Guide Book 1991~'92] (in Japanese). 38. Japan: Japan Automobile Manufacturers Association. 23 October 1991. p. 228. ISBN 4-915220-38-9. ^ Shima, Yasihiku (22 November 2013). "Imperial Family Watch: Emperor Akihito is in the slow lane when driving". The Asahi Shimbun. Archived from the original on 26 March 2015. ^ a b "92–93 GSR production numbers". Generation 2 Integra Club. Retrieved 1 January 2015. ^ a b c d "History of the Acura Integra". team-integra.net. ^ "Acura Integra Type R New Car Review: Acura Integra Type R (1998) New Car Prices for Acura Integra Type R". www.theautochannel.com. Retrieved 2018-10-13. ^ Jacobs, Caleb. "This 21-Year-Old Acura Integra Type R Just Sold for $63,800 at Barrett Jackson Las Vegas". The Drive. Retrieved 2018-10-13. ^ a b c d e f g h i j k l m n o p q "2015 Honda Digital FactBook" (PDF) (Press release). US: Honda. June 2015. p. 11. Archived from the original (PDF) on 5 September 2015. Retrieved 2 November 2016. Wikimedia Commons has media related to Honda Integra.